PURPOSE: Build a deeper relationship with the earth. PREPARATION: Find a quiet place outside where you will not be disturbed. Build on the prior connection with the earth and the mantra: releasing, receiving, connecting, co-creating. 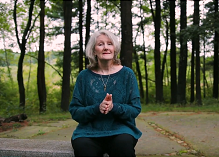 Minute one: In a comfortable seated position, feel your bottom connected to the earth and begin to access the tension and fatigue in your body. Minute two: With each breath, root deeper by dropping, releasing tension and fatigue down, and receiving nourishment from the earth. Minute three: Continue to release and receive energy, like an infinity loop between you and the earth. The earth matches your releasing and receiving, and this is how you connect and co-create. Minute four: As your body relaxes, feel and start releasing, receiving, connecting, co-creating. Minute five: Deepen releasing, receiving, connecting, co-creating. Notice the difference in your quality of sitting. What do you notice? Is energy moving in stillness? Complete your practice taking three deep body breaths and committing to re-connecting with the earth while sitting regularly. ← Cosmic Curse Jar: Compost for Gratitude! If you handle money without awareness and mindfulness of how much you are giving out and receiving, then the money just flies away, even if you have millions of dollars in your pocket. If instead you are aware of how many people worked hard for this particular banknote, how much energy they spent for it, then you begin to think more carefully about buying and selling. 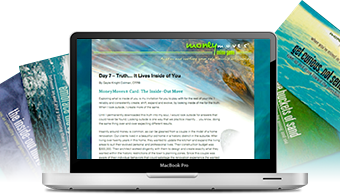 You begin to develop a relationship to money.